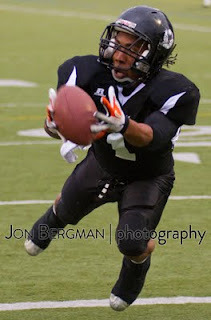 The 2011 Bellingham Blitz kickoff their home opener with a dominating performance from both sides of the ball, handling the visiting Umatilla County Panthers Saturday May 14, at Civic Field. A balanced offensive attack was the showcase for the Blitz, scoring at will via the pass and the run. Quarterback Cody Oaks distributed the ball to all of his playmakers giving five different Blitz players the opportunity to score touchdowns, including three for running back Vann Vetch. The continue their tradition of an oppressive defense, stifling the Panthers' offense through three quarters of play. Final score: 49-15. Click here to view photos of the game.